Classroom transitions can be time-consuming and steal away precious teaching time. Whether it’s lining up to go somewhere outside of the classroom, or changing to a different activity, trying to get all students to “switch gears” can be a tricky task. We can’t expect students to have smooth transitions if we don’t have a structured process and clear expectations. 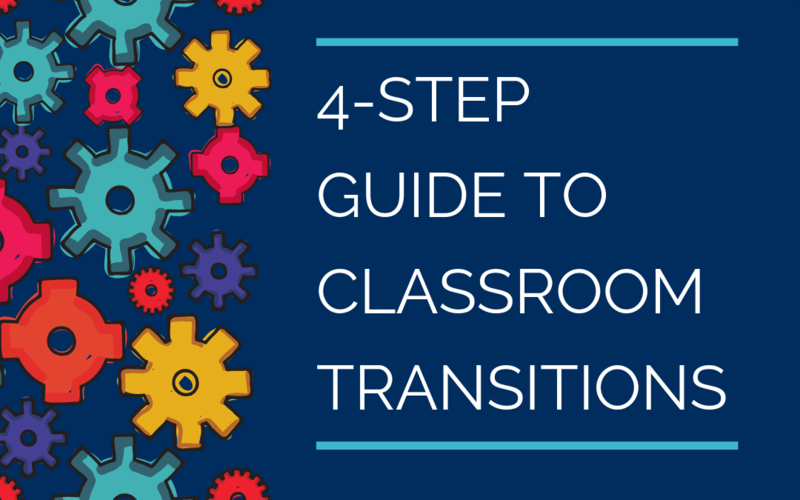 This 4-step guide can help make your classroom transitions more efficient, so you can spend more time on what matters! Use a countdown. Allow students time to wind down from their current activity or assignment. This step can be done with an actual timer, lasting the length of a song, or a virtual stopwatch displayed on the screen. When time is up, students should be prepared to end their current activity. Directly and explicitly, tell students what will be happening next (“put away _____, get out _______, line up to go to _________”). Initiate this process by using a word other than “go.” I like using the words “transition” and “let’s get prepared.” If needed, use another countdown. Take note of students who are transitioning correctly and praise them. Reteach students who seem to struggle with any of the transition steps. When Things Go Wrong Author Todd Finley offers advice for troubleshooting classroom transitions in his Edutopia.com article “Mastering Classroom Transitions.” If transitions take too long, Finley suggests making it a challenge to beat another classes’ time. When student behavior is a problem when lining up, place stickers or dots on the floor several feet apart for students to stand on. Combine a visual timer and a verbal countdown for students who don’t want to quit what they’re doing. For younger students, distraction can derail any transition, so singing a song may help keep students on track. As for any process that is new to students, it’s always a good idea to use reminders, even if you think students have it down. Practice, rehearse, and practice again.